A fusion of Latin Caribbean rhythms with a nylon string guitar as the lead instrument. Featuring Original compositions as well as Latin Classics. 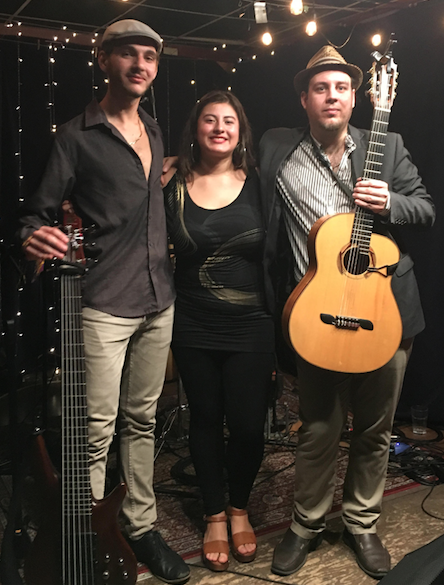 The Caribbean Club Trio is comprised of Zach Preston, Laura Varela, and William Preston. This trio embodies the unique musical essence of the Caribbean, featuring music from Cuba, the Dominican Republic, Puerto Rico, Colombia, Brazil and the occasional Jamaican reggae. It’s an old world flavor in a new package, reimagined into a trio format, instead of a ten piece band. The band of extremely talented, multitasking musicians create a unique performance experience, with everything you hear live off the floor. The trio plays 7 days a week throughout Southern Ontario during the summer months. Joining the trio today is their dear friend Michael Morabito on Alto Sax. With fiery guitar, deep soulful bass, driving percussion, and passionate vocals, this music will take you on a tropical journey! So strap in, because we’re going to the Caribbean! Fusing the rhythms of Latin America and Spanish Flamenco, Zach Preston brings a new perspective on modern Spanish guitar. With intricate melodies and a tradition of honed technique originating from hundreds of years of Spain’s Mediterranean heritage, Zach connects Latin America with Spain; countries that reside an ocean apart, but share a common musical harmony. Canadian born, Zach was soon to leave his comfort zone with the goal of learning more of Spanish and Latin American music and culture so as to better create a current and modern portrayal of what this music is, and its potential. After living in Spain, Zach ventured into Latin America where he absorbed the rhythms of Puerto Rico, Cuba, Colombia and Mexico to mesh them into a style reminiscent of Hispanic America’s and Spain’s fiery heritage. “Estilo Cohiba” is the name Zach gave to his band that backs him up. It consists of seasoned percussionists from Cuba and Colombia as well as Bass guitar and Alto Saxophone. Zach Preston -Guitarist, Studied music between Canada, Latin America and Spain. Laura Varela – Originally from Bogota Colombia, currently between Canada and Colombia while studying vocal music at Bellas Artes, Barranquila in the Carribean Coast of Colombia. Michael Morabito – Currently studying Jazz Saxophone at Mohawk College. Zach Preston created his Latin Fusion Group “Estilo Cohiba” in 2014. Between Jazz, Son Cubano, Salsa, Cumbia, Flamenco and other latin style he portrays his ideas and artistic vision. Featuring musicians from both Canada and Colombia. Zach currently splits his time between Niagara and the Caribbean Colombian Coast where you can also find a version of his group performing during the winter months.